Jewelry from E.B. 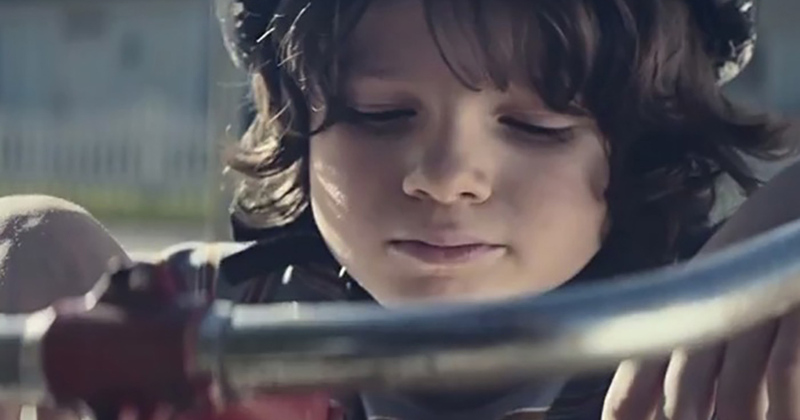 Horn is often passed down from generation to generation, so how could we help this family-owned business increase its brand awareness and engage with a new generation of potential customers? 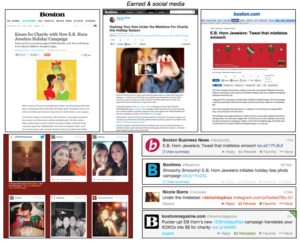 We opted for a combination of experiential marketing, digital, out of home, earned and social media to help spread the holiday cheer – and support an important local cause – with the E.B. Holiday Kiss Campaign. For every photo shared on Twitter, Instagram or E.B. 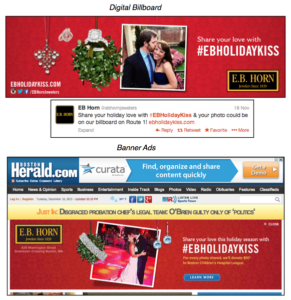 Horn’s Facebook page with #EBHolidayKiss, the jeweler donates $10 to Boston Children’s Hospital League. Check out the various elements of the campaign below, and take a moment to share your love this holiday season. Bostonians have been kissing all around town, but we still need your help to reach our goal of 500 kisses. The campaign ends Friday, so do your part and start smooching!